Brushless 90’s are hot right now… and MakerFire’s got one that is kinda cool out of the box. Fully assembled and available on Amazon it’s definitely worth checking out if the below fits your bill. What’s in that funny looking pod? Just an AiO camera and Rx… but under that is a micro F3 running BetaFlight 3.1, a 10A 4-1 ESC that supports d-shot300 & oneshot. 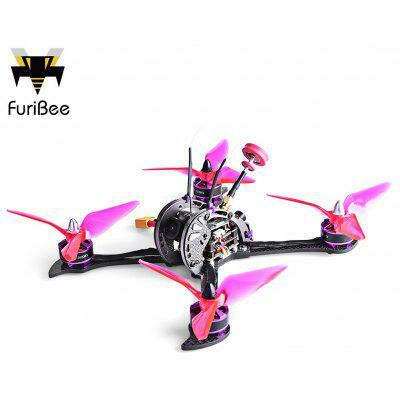 A carbon fiber frame is strapped with 1104 brushless motors and a 2s 350 lipo for power. Inside that little ufo pod is the tiny receiver, you don’t need to pull the top off, just gently slide the rx out of the hole on the side. On the bottom of the rx is a little gold button (touch it, you can feel it’s a button) hold this button while powering on the Armor 90. The Yellow light will blink fast, slow, then go solid and stay lit. Done, it’s bound and you can stuff the rx back inside the pod connect betaflight and confirm everything works now. There are a ton of good video’s on youtube to use this module, this video and the below settings works for us to bind. How does the Armor 90 Perform? It performs really good. I test alot of these things and “ready to fly“, “almost ready to fly” isn’t always the case when the binding process is a pain or firmware is all jacked up. I’m happy to report that the Armor 90 has the latest betaflight 3.1 that won’t require an expert to get going. Charge the battery, find the right video channel and go. If you coming from brushed micros, this is your next step… The Armor 90 has a punchy take off while the battery is fresh and for the 1st couple minutes you can get real crazy but around 3 minutes you can feel it begins to feel a little heavy tho not too bad that you lose confidence. MakerFire estimates 4-5 minutes while I was more like 3 1/2 to 4 minutes of hard flying. I don’t wanna call it heavy, but that’s going to be the 1st impression whether your coming from something bigger or whoop style smaller. I was able to flip, roll and hit some hoops after getting the feel for how the Armor 90 handles, even more after fine tuning betaflight. Video is legit! The OSD is Not a headache and the camera is clear with a clean signal as far as you can trust your tx signal. While I wasn’t trying to test this thing at night, I was able to keep some picture even at dusk. The Armor90 is hella fun to fly and I like it… it’s definitely not the coolest looking micro out right now ( I see now they offer it in better colors) but it is priced right for the performance it offers right out of the box. Not so super twitchy you’ll need to be a pro to look like one in the air. I would easily recommend the Armor 90 because its just such a simple kit for new and or budget flyers to go brushless, pro’s may look for something with a little more bite as upgrades besides a better battery really aren’t worth it on this frame nor are they really needed.